There are some fascinating titles coming up in the British Library's Crime Classics series over the next twelve months. The programme for the second half of this year has recently been made public, and it includes a number of books I'm really pleased about. These include The Long Arm of the Law, a collection of police stories that I've edited, for which I've just finished writing the intros. Several rare stories make an appearance, as well as some by more familiar names. 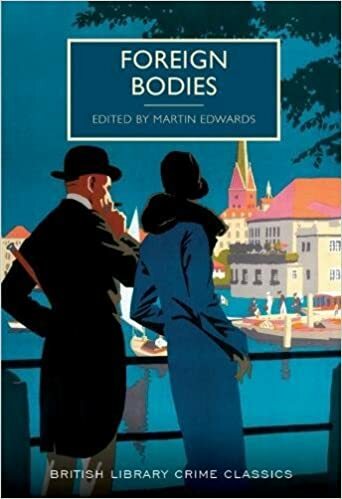 I suppose, though, that if you forced me to say which of the various anthologies I'm editing this year is likely to excite the most interest, I'd be bound to say Foreign Bodies, which is due out in October. This book gathers together classic crime stories in translation. Some of the translations are brand new, and the friends and colleagues to whom I am especially indebted include John Pugmire and Josh Pachter. It's often thought that classic crime fiction was the preserve of British and American authors. Georges Simenon is seen as an honourable exception. But the truth is more complicated, and more interesting. In reality, plenty of authors in Europe and elsewhere were writing crime stories, sometimes with a nod to Anglo-Saxon traditions and tropes, sometimes not. The trouble is, very few of these stories were translated at the time. Foreign Bodies seeks to redress the balance, and tell an interesting story about foreign crime fiction. I'll say more about the detailed contents at a later date, but at this stage let me just add that of all the many anthologies I've edited since the mid-90s, I think this one might prove to be the most striking. We'll see. Sounds great! Any chance we can have a list of the stories? Will there be any Japanese stories? Thanks for the shoutout, Martin. I'm looking forward eagerly to this collection -- and to seeing you again at Malice in a couple of weeks! JJ, I'm not able to post a complete story list yet, but I'll do so when I'm given the green light. Yes, Ted, and this is one of the things I'm pleased about. Hi Josh. Thanks again for your invaluable input, and see you soon! Looking forward to it -- this sounds like a brilliant initiative, and it's great to see the BL books branching out into such territory. Very excited! How nice Lots to look forward too! JJ, yes, I see this a real departure in all sorts of ways, while absolutely in the spirit of the Crime Classics series, and I must say that doing the research, with the help of Josh, John and co, has been really rewarding.